Being a writer myself, I know how errors creep inside text. You may not necessarily write bad grammar, but the desire to accomplish a specific deadline, or perhaps, a slip in concentration, can make grammatical errors slip through. It will certainly affect the content you create. That was something, I encountered, often. 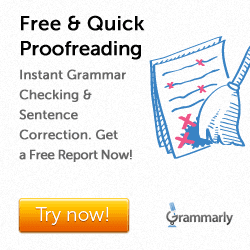 And then I saw this advertisement about grammarly. At first, the ad clipping didn’t impress me. I gave a miss. But then, I would come across banner and the text ads often during my online browsing. During one such session, I decided to click through the ad, didn’t read too much. There was something that struck me, though, and during my third visit to the site, I lapped on to the idea of a free trial. It lays down every mistake you commit. It starts right from the spelling mistakes. The software points out spelling mistakes if it’s there in the content. The grammarly software searches the text and points out grammatical errors in a perfectly organized manner. Any mistake in the usage of articles or incorrect use of a preposition is taken care of. The software points out incorrect use of adjectives and adverbs, and many more grammatical errors. It also points out punctuation errors. It’s not only about pointing grammatical errors, but in the process also guides you to correct those errors with suggestions. When you finish grammatical restructuring, the software then allows you to enhance content. By enhancement, I mean using appropriate words within the sentence, which brings better style into the content. What strikes me most is the ease by which the software allows the user to change or restructure the content. I particularly, love the enhancement feature, simply because the choice is with you, whether to augment a particular word, or a phrase, or ignore it. If, at any point of time, you believe that the word you have in the content is much better than the given options, ignore the enhanced options, and move to the new sentence. That’s what makes grammarly more appealing. It can be used both as a word and a sentence checker. You can also perform analysis according to the content you have. There are 6 categories to perform check, starting with general, business, academic, technical, creative and casual. For instance, if you are writing an academic assignment, use academic option when you do grammar check. Finally, the best for me is I don’t have to log in every time I use grammarly on my laptop. Once I log in, I am logging in forever, unless I log off, which means that even if I don’t work for a week, and open my laptop after a week, I am still in the log in mode. It saves precious time. You can talk a lot about benefits, but if those benefits don’t really work, then I don’t think it’s worth talking about. I use the software myself, and I can tell for sure, it works for me. And if it works for me, then I am pretty sure, it will work for everyone else because my grammar is sometimes quite shocking, even for me to understand what I write. It’s hard for me to find any drawbacks with Grammarly, but I think, the software can help users more with the use of tenses. You should be trying Grammarly, and I am convinced, it will not disappoint you.